Learning how to paint with watercolors can be tricky, which is where these versatile watercolor pencils come into play. 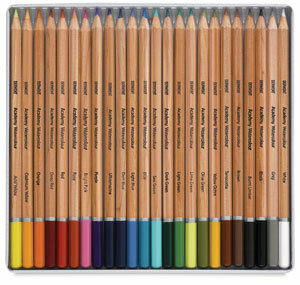 Derwent Academy Watercolor Pencils can be used dry to draw fine details and backgrounds. To create fluid watercolor efects, simply draw a wet paintbrush over the pencil strokes. The rich pigments dissolve and blend easily to create a wide spectrum of shades. A hexagon-shaped barrel assures control and precision. Academy Watercolor Pencils, Set of 24 — This set includes Acid Yellow, Cadmium Yellow, Orange, Deep Red, Red, Rose, Bright Pink, Ultramarine, Dark Blue, Light Blue, Blue, Sea Green, Dark Green, Light Green, Lime Green, Olive Green, Yellow Ochre, Terracotta, Brown, Burnt Umber, Black, Grey, White, and Purple. Academy Watercolor Pencils, Set of 12 — This set includes Black, Burnt Umber, Terracotta, Yellow Ochre, Light Green, Dark Green, Light Blue, Ultramarine, Purple, Red, Orange, and Cadmium Yellow.